Executive Staff – OATH, Inc.
Aaron Laine resides on the OATH Executive Staff as the Land and Ranch Development Director. Aaron will aid us as we negotiate with land and ranch owners in order to help OATH spread their operational footprint in terms of event locations throughout the nation with a primary focus on the great state of Texas. Aaron grew up in Angleton, Texas and graduated from home school and Brazosport Christian School in 2000. He worked in the land surveying field for 13 years until going into survey equipment sales in 2009 with G4 Spatial Technologies. Aaron has also been guiding/outfitting/leasing property for 16 years, where he has worked for Tejas Outfitters and Brush and Bay Outfitters, the company he has owned for 8 years. He has worked with veteran groups doing hunts for about 7 years and has supported OATH for a little over a year now. Aaron says, “I really enjoy giving back to veterans and seeing the excitement on their faces when they get to harvest an animal that they have not previously been able to. The camaraderie seen at camps when multiple vets get together is an awesome sight to see. No matter the differences in backgrounds or what has happened in their lives they always have a common denominator in being in the armed forces. Being able to get them out on a ranch and let them relax for a weekend is probably the most enjoyable thing I have been doing since I got into outfitting. 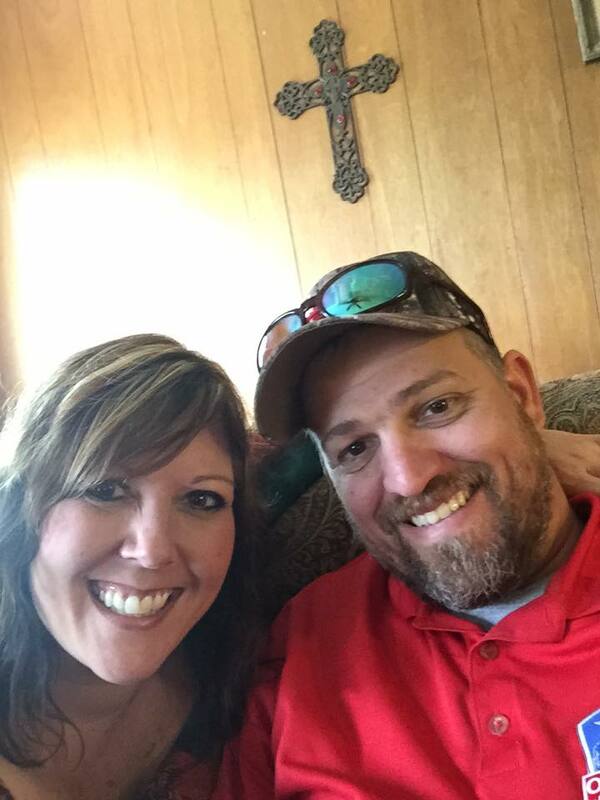 No matter what we are out trying to kill they always are appreciative.” Aaron has been married for four years, and he and his beautiful wife Bekah have one child, a little boy named Lawrence Lee Laine. It is Aaron’s hope that his son will like hunting and that he can get him out in the field. OATH counts herself extremely fortunate to have Aaron’s experience, friendship and devotion in her ranks, and we invite you to help us welcome Aaron to the OATH faithful family !!! Should you be a Ranch Owner, Land Owner or Outfitter that would like to host an OATH trip, please feel free to contact Aaron here ! Dallas Bozeman blesses OATH in his role as our Veteran Care Director. Dallas graduated from James E. Taylor High and soon thereafter joined the United States Air Force. Dallas graduated from the Naval Explosive Ordnance Disposal School in 2004, and his career took him all over world, serving in Europe, Asia and the Middle East as he served four combat tours to Iraq as well as Southern and Eastern Afghanistan. Dallas has been married to his wife Kimberly for 10 years and has 3 children. His combat recognitions include The Bronze Star, (2) Purple Hearts, and numerous other Commendations. He was also recognized as the Air Force Non-Commissioned Officer of the Year (Military Technician) and Air Combat Command Pitsenbarger Award for Heroism. After completing 11 years of active duty service, Dallas Bozeman decided it was time for a new chapter with his family and a chance to pursue his passion for leadership and changing lives. Via OATH’s rollout of VALOR, a new program geared towards helping our men be the men that they have been called to be, Dallas is helping to bring new meaning to our OATH male veterans. Please join us as we welcome Dallas to our wonderful family, and should you have any questions about his role at OATH, please feel free to email Dallas here ! Don McDonald serves on the OATH Executive Staff as our Task Force Change Program Director. In this capacity, Don’s chief role will be to direct the Task Force Change program nationwide by adding businesses and companies to our partner list via an established team in the OATH state chapters, as well as the OATH Regional Chapters. OATH counts herself extremely fortunate to have Don’s experience, friendship and devotion in her ranks, and we invite you to help us welcome Don to the OATH faithful family !!! Should you be a Business Owner or Company Owner that would like to join the Task Force Change program, please feel free to contact Don here. Jim Broyles fills a very important role on our OATH Executive Staff as our Vietnam Veteran Director. Brought on staff in December of 2017, Jim will help us focus on our Vietnam Veteran ranks within OATH. Not only will he work to bolster our ranks with some of these specific heroes, but he will also work closely with our other staff to plan, organize and execute events that focus solely on these specific Veterans. Having served in the Vietnam War himself, Jim understands the challenges facing our Vietnam Veterans, and under his guidance, OATH will be wildly successful in our support efforts for this special Veteran population. While serving 35 years in the United States Army, Jim completed numerous leadership courses, to include Advanced Infantry Training, Non-Commissioned Officer Candidate Course, Airborne Training, Ranger School, Arctic Survival School, 05B, Radio Operator School, Sixth Army NCO Academy, Basic Non-Commissioned Officer Course (Distinguished Graduate), Survival, Evasion, Resistance and Escape (U.S. Navy), Drill Sergeants School, Advanced Non-Commissioned Officer Course, First Sergeants Course (TXARNG), Armor Crewman (TXARNG), and the United States Sergeants Major Academy. For his amazing dedication and service to our nation, Jim was awarded many decorations, awards and citations, to include membership into the United States Army Ranger Hall of Fame, Legion of Merit, Combat Infantry Badge, American Parachutist Badge, Vietnamese Parachutist Badge, Australian Parachutist Badge, Drill Sergeants Badge, Order of Saint Maurice (National Infantry Association), 2 Bronze Stars with “V” Device, Bronze Star for Meritorious Service, Purple Heart, Meritorious Service Medal 2 OLC, 2 Air Medals, Army Commendation with “V” Device, Army Commendation for Service 2 OLC, Army Achievement Medal, Army Good Conduct Medal (Third Award), Army Reserve Components Achievement Medal, National Defense Service Medal, Viet Nam Service Medal, NCODP Ribbon with 3 Device, Overseas Service Ribbon, Reserve Component Overseas Service Training Ribbon, Viet Nam Campaign Medal, Texas Faithful Service Medal, Kosovo Campaign Medal, German Army Marksmanship Badge (Gold), Global War on Terrorism Medal, and the Non-Article 5 NATO Medal. His Civilian Affiliations include the National Guard Association of Texas (Life Member), Disabled American Veterans (Life Member), 75th Rangers Association (Life Member), Masonic Lodge, and the Veterans of Foreign Wars (Life Member). 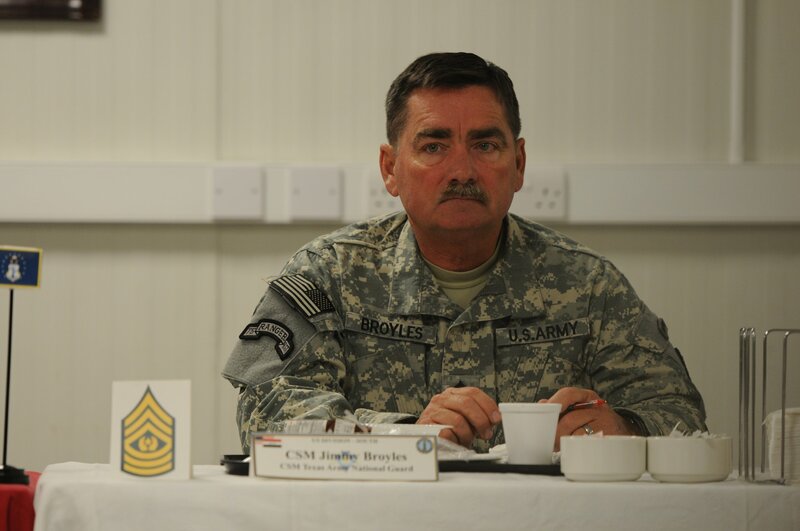 He has significant experience in the United States Army, to include HQ, TXARNG-Army Guard Command Sergeant Major, HHC 36th Infantry Division- Division Command Sergeant Major, HHC Engineer Bde. 36th Infantry Division TXARNG (Command Sergeant Major), HHC Task Force Houston, Kosovo, (Command Sergeant Major), HHC 4thBn 112th Armor TXARNG (Command Sergeant Major), HHC 3rd Bn 144th Inf (M) TXARNG (Command Sergeant Major), HHC 3rd Bde. 49th Armored Division TXARNG ( Opns SGM), HHC 1/112th Armor TXARNG (First Sergeant), CO C 3/144th Infantry TXARNG (First Sergeant), CO B 1/143d Infantry Airborne TXARNG ( First Sergeant), CO C 3/144th Infantry TXARNG (First Sergeant), CO A 1st Bn OSUT 1st Student Training Bde (Senior Drill SGT), III Corp and FT Hood, NCO Academy (Senior Instructor), CO C 1/75th Infantry Airborne Ranger (Squad Leader), CO B 75th Infantry Airborne Ranger, Seventh Corp (Recon Team Leader), CO H 75th Infantry Airborne Ranger, 1st Cav Division Viet Nam (Recon Team Leader), CO L 75th Infantry Airborne Ranger, and 101st Airborne Division Viet Nam (Recon Team Leader). In addition to his distinguished military career, Jim also served in the law enforcement ranks where he was assigned to the FBI Narcotics Task Force in Plano, TX. He also spent 10 years with the Denton County Sheriffs Office, 11 years with the Collin County Sheriff’s Office, 1 year with the Denton Police Department, and 4 years with the Department of Energy as a Federal Officer. Perhaps you’re a Vietnam Veteran curious about what OATH has to offer, or a Ranch or Land Owner that is interested in hosting an event, or a Company or Business desiring to sponsor an event. If so, you may contact Jim here in order to gather more details as we work together to change lives !